In a letter addressed to Ben Ohlmeyer, Envirofluid CEO, the Hon. 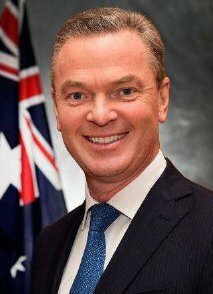 Christopher Pyne MP, Minister for Defence Industry, commended Mr. Ohlmeyer for his ongoing engagement with the department and his commitment to ensuring the safety of Australian Defence Force personnel. 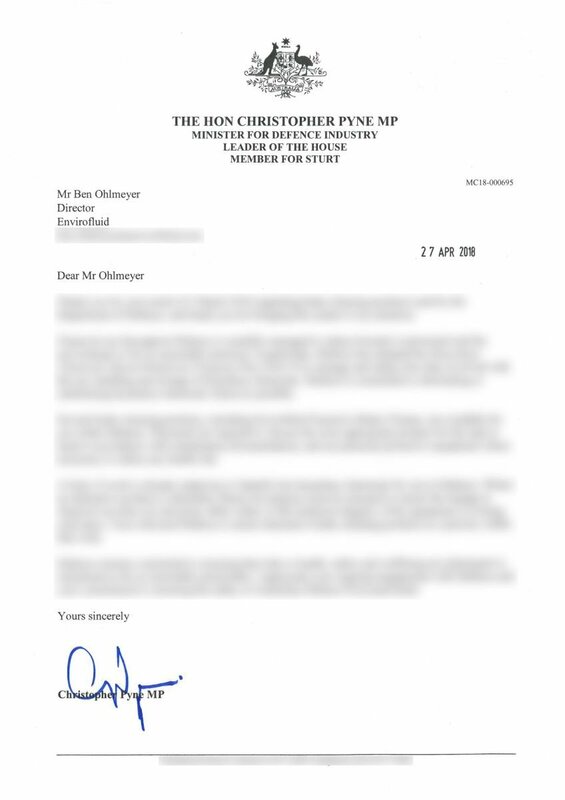 The letter was written in response to Mr. Ohlmeyer’s message to the Minister regarding brake cleaning products used by the Defence Department. In its ongoing commitment to eliminate or substitute hazardous chemicals wherever possible, the Australian Department of Defence has adopted the Hazardous Chemicals Hazard Reduction Program Plan 2016-2019, which helps the department to manage and reduce risks involved with using, handling, and storing dangerous chemicals. As part of the program, a body of work is currently underway to identify less hazardous chemicals for the department’s use. Alternative products are also assessed to ensure that they do not adversely affect the equipment’s safety and technical integrity. Having received many endorsements from Australian Department of Defence for the past 18 years, Envirofluid continues to supply Triple7 and Purasolve products for General Maintenance, Repair and Operations (MRO) Related Spares and Consumables. Purasolve Brake Cleaner is among one of many Worksafe, eco-friendly products supplied by Envirofluid to the Defence department. Purasolve Brake Cleaner is an ultra-safe, low vapour pressure solvent designed for cleaning brakes and components in a variety of industrial, automotive and avionic applications. It contains no harmful components such as ozone-depleting substances, sulphonics or phenolics, chlorinated and halogenated solvents, glycol ethers, builders or reagents, caustics, synthetics, or aldehydes. In addition, it has very low Volatile Organic Compound (VOC) emissions and is less hazardous for waste disposal. In contrast, most traditional aerosol brake cleaners contain either Tetrachloroethylene (also known as perchloroethylene or PERC) or n-Hexane, both dangerous chemicals that pose health and safety risks. Aside from being classified as a Group 2A Carcinogen by the International Agency for Research on Cancer and carrying a range of serious health and safety risks through short- and long-term exposure to the chemical, Tetrachloroethylene is also extremely dangerous when heated. It creates Phosgene, a pulmonary choking agent that can be fatal in doses as low as 4 parts per million, when heated past 315 degrees Celsius. On the other hand, nerve damage due to repeated exposure to n-Hexane is not uncommon. This can result in temporary headaches, dizziness, and loss of appetite in the short-term, and a gradual degradation of sensorimotor function, muscle weakness, and loss of sensation in the long-term. The Minister also stated that the Australian Department of Defence remains committed to ensuring that risks to the health, safety, and wellbeing of personnel and the environment are eliminated and minimised so far as is reasonably practicable.